Ever since reading On Basilisk Station I have been extremely, extremely wary of anything that hints at military science fiction. That was a good book, and I got attached to the characters, and then it caused me sleepless nights for days after I finished the thing. Not exaggerating. But Old Man's War has been on my list for ages (since Nymeth's review, to be exact) and I thoroughly enjoy John Scalzi's nonfic writing. So, looking for something different for my genre book club, this made the cut, and I went ahead and read it. Not without trepidation, which was somewhat justified, but I'm very glad I was brave and didn't cheat by just reading a summary on Wikipedia. Without giving too much away: John Perry is 75, and he is about to join the army. The Colonial Defense Force, to be exact. Humans are a spacefaring race, but we're not the only ones, and competition for habitable planets is fierce. Earth is a quarantined backwater, and the only way off for most of those humans is the way Perry has decided to go: volunteering for the military force that keeps human colonies safe, scouts out, and (as necessary) takes by force new habitable planets for colonization. But the CDF only takes recruits of a certain age, and John Perry has made it there. And he is smart enough to know that the universe is a strange place - but nothing could prepare him for how strange, wonderful, and terrible it really is. And it is easy to give things away, so I'll stop with a summary there. There are numerous little and some large surprises along the way, for Perry and therefore by extension for us. Some of them are funny, some of them are dark, some of them are just plain cool. I do not wish to spoil them for you. What is interesting to me is how smart this book is. Which is not to say that science fiction, or military science fiction, or space opera (which this is, I think, though I have a surface understanding of the term) cannot be smart, and knowing what I do of John Scalzi I should have been prepared for just how smart this book is. But a large part of me had written this off as a fun book, a book with spaceships and larger-than-life heroes and battles and really nifty technology, written well and probably often quite amusing because, well, Scalzi. And I also assumed that there'd be some major space battle and most of the characters I'd grown to like would die, because I respected John Scalzi's intelligence and integrity enough to figure he wouldn't write a book about a space army without characters dying. He wouldn't play with the reality of what war is that way. I am realizing this doesn't reflect well on me -- because yes, I'd apparently bought into the stereotypes I carry secretly about mass-market military science fiction, and I expected that sort of thing. I got a lot more and that is why I should read out of my comfort zone more often. Or one reason, anyway. There were two themes that really struck me and stayed with me, and that were investigated in more depth than I would have expected. The first was aging, and what it means to grow old, and that theme really shouldn't surprise anyone, given the summary of the book I gave above. The second was marriage and love, and what marriage is, and what it means over a lifetime, and that is not the sort of thing I expected in a military SF book at all. Aging, both mentally and physically, plays the largest role at the beginning of the book, but does come back again in interesting ways later on. Perry is 75, and despite the fact that we're a lot further in the future and some medical advances are to be expected, no one on Earth has come up with a way to reverse the aging process, and 75 in that future looks pretty darn similar to 75 in this present. Except that the CDF has apparently found a way to get a 75-year-old human into some sort of fighting shape. What this means, and what this means to Perry as an individual, and some of his newfound friends, is investigated pretty intimately, since the book is from Perry's perspective in first person. It's handled with sensitivity and insight and I was impressed. I was even more impressed, and somewhat flabbergasted, to find marriage holding a central role in the book. Perry's wife Kathy had also volunteered to sign up, but died of a massive stroke before her 75th birthday. He misses her, thinks of her often and often first, and while I wouldn't say that the Perrys' marriage plays a central role in the book's plot, exactly, it is such a central part of John Perry's character that it therefore looms large over the whole book. It's a rumination on the effect on a person of sharing the better part of a life with someone else one loves dearly. It adds a very human dimension to Perry, who could possibly be a larger-than-life character, except that he is so grounded in this very fundamental relationship that has very much defined who he was and is. And it adds a very warm, gentle dimension to a book that is, at its core, about someone learning to be a good, efficient, and effective soldier. Unexpected, and delightful. The writing is also just excellent, the world imaginative, and other themes and conundrums interesting and worthwhile. Characterization is solid at worst and really, really good at best. I've recommended this book to several people since reading it. One of my book club members has already come back for the second book in the series, The Ghost Brigades. I may even read that one myself, though I'm pretty satisfied with where I left John Perry and company. 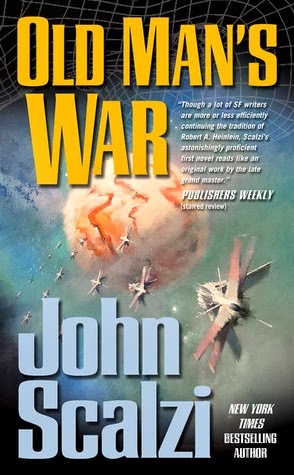 I wasn't sure it was possible for me to have a higher opinion of John Scalzi than I already did, but reading Old Man's War managed to surprise me there, too. I recommend the next two. They weren't quite as good as the first one, but what is? And I remember liking very different parts of each of them. You're so right about the marriage being a central part of Perry's character. I could definitely see reading the next ones. A couple of the people from my book club already have, and a couple more are waiting for the second book to come up on hold for them. Very positive comments all around.